The only thing Aristedes Aquino apparently needed to turn his season around was to look at himself. From the outside. The Reds' No. 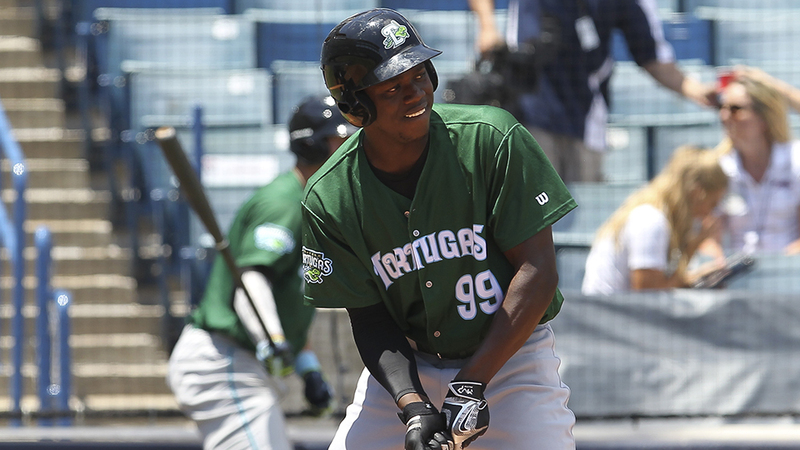 22 prospect hit his fifth homer in his last six games on a three-hit night to lift the Class A Advanced Tortugas past the Lakeland Flying Tigers, 7-4, on Tuesday night at Joker Marchant Stadium. Aquino has plated 11 runs during a six-game hitting streak, raising his average nearly 100 points in the last week from .157 to .250. According to Daytona hitting coach Gookie Dawkins, all it took was a little video session to set things right. "We looked at some film and saw that his hips were flying open pretty bad," he said. "We started doing drills about a week ago to keep his hips in so he'd stay square. He's been tearing it up ever since and he's feeling good. It's all about his approach right now. He's taking some good pitches, he's gotten into a good rhythm and is hitting the ball well right now." Aquino led off the second inning with a homer to left field, his fifth blast of the season. After striking out in the third, he reached on a bunt single in the sixth, took second on a throwing error by third baseman Zach Shepherd and scored on Brian O'Grady's sacrifice fly to center. The 22-year-old outfielder lined an RBI single to left and stole his fourth base of the year in the seventh. Attempting to match his career high of four hits, Aquino grounded out to reliever Edgar De La Rosa in the ninth. "While his numbers early weren't great, I think he was having some bad luck and then got into the bad habit with his hips," Dawkins said. "I told him to be able to hit the balls hard and give himself a chance, he can't be flying open. So right now, his mind-set is to stay as square as possible. He's being very selective and not chasing and he's definitely not missing his pitches. He's keeping his hands back and the barrel [of the bat] is in the zone longer." Signed by the Reds as a non-drafted free agent in 2011, Aquino struggled in his first taste of full-season ball in 2015, slashing .234/.281/.364 over two stints with Class A Dayton in the Midwest League before getting off to a slow start in the Florida State League this year. With the native of the Dominican Republic still filling into his 6-foot-4, 190-pound frame, Dawkins expects to see him clear the fences more as he continues to mature. "I'm not surprised at all," the hitting coach said. "I saw him a little bit in Spring Training last year and I could tell then he was a strong guy. We've stressed to him to keep the mind-set about just hitting line drives and not worry about the home run. With his strength and quick, line-drive swing, they'll come ... and now they're starting to. There's no doubt he'll hit 25 homers a year as he gets older and gets more reps. He just needs to keep doing what he's doing and he'll be fine." Tortugas starter Tejay Antone (2-2) allowed four runs on 11 hits with four strikeouts in six innings. He didn't issue any walks. Flying Tigers reliever Willy Paredes (0-2) surrendered four runs -- three earned -- on four hits in 1 2/3 frames. Detroit's No. 4 prospect Christin Stewart belted his ninth home run. He shares the Minor League lead with High Desert's Travis Demeritte.